Tag Archive | "BEST BEFORE"
If you’ve bought raw cashew pieces at Trader Joe’s, you will want to pay attention to this recall. 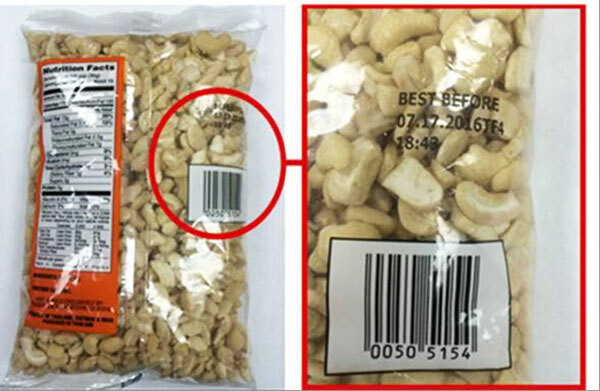 Heritage International (USA) Inc. of Compton, Calif., is voluntarily recalling one lot of Trader Joe’s Raw Cashew Pieces with the following code “BEST BEFORE 07.17.2016TF4” because of potential contamination with Salmonella. Salmonella is an organism that can cause serious and sometimes fatal infections in young children, frail or elderly people, and others with weakened immune systems. Healthy persons infected with Salmonella often experience fever, diarrhea (which may be bloody), nausea, vomiting and abdominal pain. In rare circumstances, infection with Salmonella can result in the organism getting into the bloodstream and producing more severe illnesses such as arterial infections (i.e., infected aneurysms), endocarditis and arthritis. 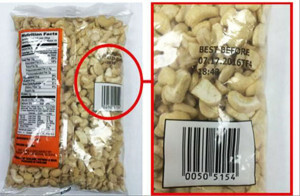 The front and back of the Trader Joe’s Raw Cashew Pieces which have been recalled. The photo above show the lot code location. 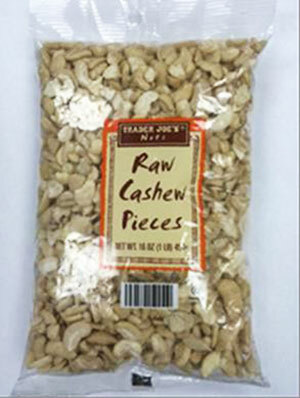 The recall only affects one specific lot of Trader Joe’s Raw Cashew Pieces. The product comes in a 16 ounce, clear, non-resealable plastic package (with a barcode number of 00505154) and with the following lot code, “BEST BEFORE 07.17.2016TF4.” The “BEST BEFORE” information can be found on the backside of the package above the barcode. The product was distributed only to Trader Joe’s stores in Connecticut, Delaware, Georgia, Idaho, Illinois, Indiana, Iowa, Kansas, Kentucky, Maine, Maryland, Massachusetts, Michigan, Minnesota, Missouri, Nebraska, New Hampshire, New Jersey, New York, North Carolina, Ohio, Oregon, Pennsylvania, Rhode Island, South Carolina, Tennessee, Vermont, Virginia, Washington, Washington D.C. and Wisconsin. The voluntary recall was initiated by Heritage International (USA) Inc., after routine testing by an FDA contract laboratory revealed the presence of Salmonella in one lot of Raw Cashew Pieces. Other lots tested by the FDA contract laboratory and further testing of this lot by Trader Joe’s resulted in no additional findings of contamination. Customers who have purchased the specified lot code (BEST BEFORE 07.17.2016TF4) of Raw Cashew Pieces are urged not to eat the product, and to dispose of it or return it to any Trader Joe’s for a full refund. Customers may call Trader Joe’s Customer Relations at (626) 599-3817 6:00AM-6:00PM PST, Monday-Friday, with any questions.